The TaskMerlin API enables you to create custom .NET applications that use a TaskMerlin database. The API exposes objects for programmatically creating and modifying TaskMerlin projects and tasks. The API is named Interfathom.TaskMerlinData.dll and is located in the folder where TaskMerlin is installed on your PC. There is also an API Class Library Help file provided called TaskMerlinData.chm. You can download an API example project as a ZIP file. The example project is written in C# and can be compiled with Visual Studio. 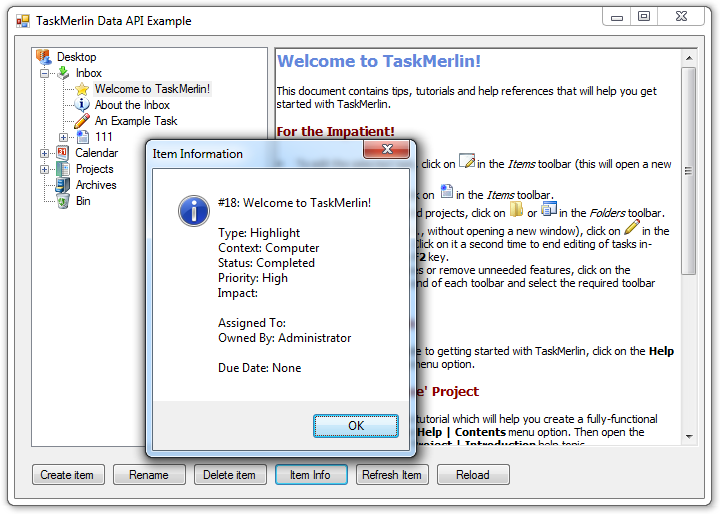 Note that TaskMerlin needs to be installed to compile and run the example project. The example project uses the TaskMerlin API to connect and logon to MyTasks.tmdb and display all the projects and tasks in a tree view. It also provides buttons for viewing information about an item, editing the summary, deleting an item or creating a new item. To get an idea of what code that uses the TaskMerlin API looks like, the following method iterates through the items in the Inbox and displays the priority of all incomplete tasks. "Congratulations! TaskMerlin is intuitive, functional and scalable. This is the first task manager I've seen that really adds value to the task management process."